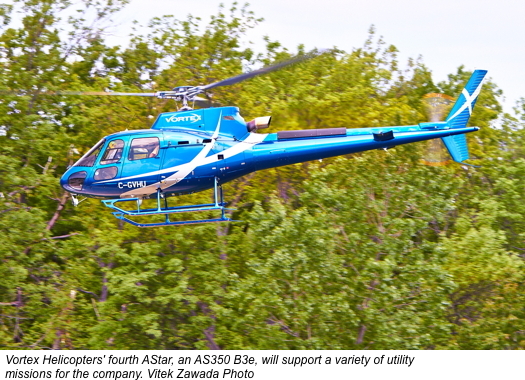 Vortex Helicopters has chosen its fourth AStar aircraft, an AS350 B3e that will join its existing Eurocopter fleet. The new AS350 B3e will support a variety of utility missions that include the expanding oil sands industry in northern Alberta. Vortex Helicopters’ has selected numerous Eurocopter optional equipment items for their new AS350 B3e, including: Dual Hydraulics (increases MGW to 2370 kg), Enhanced Thermal Protection (MTOP extension to 30 min/max), Right-hand Cargo Pod for increased cargo capacity, Enlarged Vertical Reference Window for increased visibility for long lining, Cargo Mirrors to ease maneuverability, Settling Protectors to maintain tail rotor ground clearance, Longline Release for utility operations, Oil and Fuel Filters as well as, a Canadian Audio Package. Additionally, the AS350 B3e will be equipped with a Cargo Swing and Latitude Skynode S2300 Flight Tracking.